Movies and TV shows glamorize the accomplishments of high-end cat burglars. From Ocean’s 11 to Now You See Me, we all love to root for the bad guy with good intentions. But no one’s a fan of the jerks who break into the homes of hardworking citizens and steal the high-end treasures we worked really hard to afford. What’s making your home so appealing to thieves? If you live near a large population of young people, in a neighborhood with a higher-than-average drug problem, an area with already high urban crime or places that bring in a large number of strangers (e.g., shopping centers, sports arenas, transit stations, a major thoroughfare), you’re more vulnerable to burglary, because burglars may be more familiar with potential targets, and residents are accustomed to strangers. Homes on the outskirts of neighborhoods are more vulnerable, because fewer neighbors will be able to see if a crime is being committed. This includes dead-end streets, cul-de-sacs and locations with few outlets. Any house that’s secluded may also be a target. Corner homes are iffy. They allow thieves to scope the area (including your habits) easily by simply driving by and naturally slowing or stopping for a turn. Depending on your neighborhood’s layout, they may also be less visible to neighbors and police. If you’ve already been burglarized, chances are, another thief will find you equally as vulnerable as the first one did. Additionally, the original thief may come back if he wasn’t caught the first time. If he doesn’t come back for you, he may come back to your neighbors, because he considers it a successful area. The way your house is landscaped or built can make your home attractive to thieves. They like places to hide. Bushes growing under windows and low-hanging trees are a thief’s best friend. What they aren’t fans of are prickly landscaping and anything that makes noise, like rocks or gravel. They may also target homes that have architectural features that make it easy. Solid fencing (especially privacy fences) and features that obscure a door or window are popular choices. 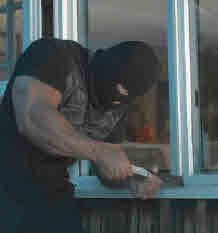 About 60% of home burglaries happen during the daytime, and most of those are during the workweek. That’s right… while you’re at work. Most thieves don’t target occupied houses. They also get a bit giddy when they see overgrown yards, mail or papers piling up, a sign you’re on vacation. Not surprisingly, on average, homes that are burglarized tend to be homes that have no dogs. Large dogs may present a physical threat, but don’t count ankle-biters out. They bark and attract a lot of attention. For those who do strike at night, poor lighting makes it harder for neighbors to see what they’re doing. They also like homes without security systems (or without engaged security systems) and with no surveillance cameras. Read more about how effective security systems at preventing burglaries. In some areas, side or back entries are the most common access point. In others, it’s the front door. This probably reflects regional architectural differences. Either way, houses with entry points weakened by disrepair, residents who leave doors or windows unlocked routinely, or homes with other weakened security (like broken alarms) are more likely to be successfully burgled. Larger and more well-maintained homes with signs of wealth (like expensive vehicles) tell thieves there may be a better payoff at your house. But the most expensive houses likely have security features that make them unappealing to most thieves. Of the people quizzed in a recent Nationwide Insurance survey, 41% of homeowners aged 18 to 34 years post photos and updates on social media while they’re on vacation. ABC News reported the story of a woman who was burgled by an old friend she hadn’t seen in years when she posted about a concert on Facebook, and another man was robbed after tweeting about his vacation plans. But it doesn’t stop there. The DOJ publication notes that burglars often know their victims. They may be casual acquaintances (like the lady who does your nails or a close friend or relative of hers), people who provide a service (like a gardener or technician), neighbors or even friends or relatives of friends. All of these people may know a bit more about your routine than the average person (or are people you or an acquaintance of yours may reveal information about your plans to). According to The National Center for Victims of Crime, reported burglary rates are higher in cities outside metropolitan areas. Rural areas in particular present their own challenges. According to The National Sheriffs’ Association, those who live in isolated rural areas have unique challenges due to the isolation and expensive equipment that’s often left unprotected by the owners (in an area less patrolled by officers). 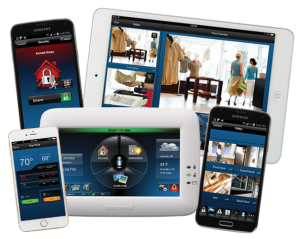 Interested in keeping your home more protected? Call Keystone Security Systems today and take advantage of our 75 Point Threat Assessment today!